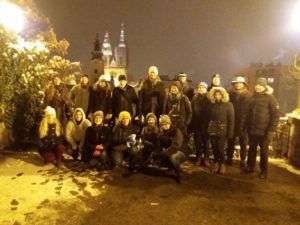 On 23-24 January 2019 a knowledge exchange workshop of the GeoERA projects MUSE and HotLime was held in Zagreb, Croatia. 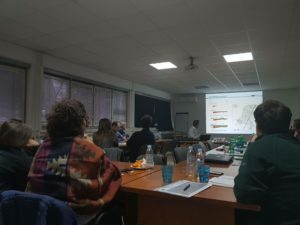 The Croatian Geological Survey, partner in both projects, hosted the workshop. Topic of the workshop was temperature modelling for geothermal energy. Lecturers presented their temperature models for deep and shallow geothermal purposes. Modelling for shallow geothermal purposes comprise a modelling domain from the surface down to around 300 m, or even shallower, whereas temperature models for deep geothermal energy reach down to 7000 m below surface. The lectures revealed similar crucial points for deep and shallow temperature models. Data density and boundary conditions on the top and bottom of the model are important for temperature modelling regardless the depth regime. Thorsten Agemar (Leibniz Institute for Applied Geophysics), Gregor Goetzl and Cornelia Steiner (Geological Survey of Austria), and Hans Veldkamp and Maartje Struijk (Netherlands Organisation for Applied Scientific Research) shared their know-how and experiences from previous and ongoing projects with 24 workshop participants from 10 partner institutions. A fruitful discussion on the presented methods and on the best way to apply the experiences in MUSE and HotLime completed the workshop. ← Geomanifestation or Spa City? BOTH!